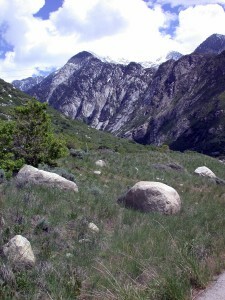 Glacier erratics at the mouth of Little Cottonwood Canyon. This road tour begins at a Salt Lake County geologic view park, located just north of the intersection of Wasatch Boulevard and Little Cottonwood Road. From here you can view evidence of prospectors seeking riches, glaciers creeping down the canyon, and earthquakes rupturing the ground. North of the canyon mouth are mine dumps located in the oldest rocks (greater or equal to 1.6 billion years) in the canyon: the schist and gneiss of the Little Willow Formation. Prospectors mined minor gold deposits within this formation. A massive glacier carved the canyon into its classic U-shape over thousands of years beginning about 30,000 years ago. This 12-mile-long glacier, the longest and largest in the Wasatch Range, stretched from Albion Basin down to Lake Bonneville’s shores. The boulder-strewn ridge on the south of the canyon mouth is the left-lateral moraine; the right-lateral moraine is pushed up against the hillside on the north. As you drive up the canyon, additional glacial evidence can be seen: hanging valleys between miles 4.6 and 6.3 on the south side of the canyon, and moraine remnants. Repeated large earthquakes in the past tens of thousands of years created the long, steep slope cutting across the canyon mouth. 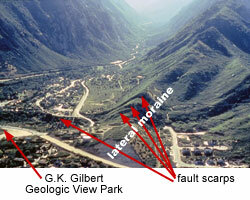 In this area, the Wasatch fault contains some of the largest geologically recent fault scarps in Utah. 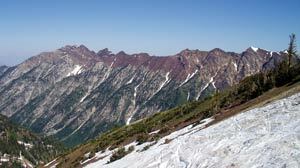 The darker rocks at the mouth of the canyon, together with the darker (shale) and lighter brown (quartzite) rock layers along most of the northern ridge line up to Snowbird, were deposited as clay and sand in a marine tidal environment 1 billion to 850 million years ago. Unconformably abutting these oceanic deposits (near mile 8.6) is a dark-colored rock unit called glacial till that contains a hodgepodge of boulders, cobbles, and pebbles abandoned by continental glaciers around 850 million years ago. The light-colored quartz monzonite (granite) that forms the majority of the canyon walls intruded as magma and hardened underground about 31 to 30 million years ago. The buff-colored quartzite, brown shale, and black and white limestone seen in the upper third of the canyon record the advances and retreats of multiple, long-lasting oceans present between 540 and 330 million years ago. Originally layered horizontally from oldest to youngest, these rock layers have been disarrayed by folding, tilting, and faulting. Located at the head and along the eastern ridge line of the canyon is another intrusive igneous rock. This magma body intruded about 35 to 33 million years ago and hardened into a granite-like rock called granodiorite. Both intrusives in this canyon aided in creating the rich mineralization found in Little Cottonwood mines. Numerous mine dumps dot the mountainsides surrounding Alta, evoking images of the once-lively mining district.